You would probably think I was kidding if I asked you, “Do you have the right equipment for an enjoyable Bible reading experience?” I mean, all you need to read the Bible is a Bible, right? While there certainly is a point to that, many people do not make a regular habit of reading their Bibles because they frankly don’t enjoy it. The two most common reasons people do not enjoy reading their Bible is because they don’t understand what they are reading, and because they feel they don’t get anything out of it. I am happy to tell you that obtaining a few simple items can help make your Bible reading both enjoyable and enriching. It is important that you find a version of the Bible that is easy for you to read and understand. If you are a new Christian, or have difficulty reading, the King James Version of the Bible is probably not the best one for you. If you find it is hard to read the version of the Scriptures you currently own, it is probably time to make a change. Fortunately, we in North America are blessed to have several good, solid translations of the Bible to choose from. There is a version out there for everyone. May I suggest a few? The New Living Translation (2nd Edition, Tyndale House Publishers) is an excellent version of the Scriptures for a new Christian, or someone who has difficulty reading. Its simple language makes the Bible clear and understandable while remaining faithful to the original text. The New American Standard Bible (Lockman Foundation) is one of my personal favourites. It is a very literal word-for-word translation from the Hebrew and Greek texts. Because it is a little more technical, it tends to read at a Grade 12 to University level. The English Standard Version (Crossway) is a fairly recent translation of the Bible that combines linguistic accuracy with clear readability. The ESV is the primary version I currently use in my preaching and teaching. The New King James Bible (Thomas Nelson) is a version that up-dates the language of the original King James Version. The result is a translation of the Scriptures that is clear and readable, and has gained quite a wide acceptance. And, hey, if the Old King James works for you, go for it! 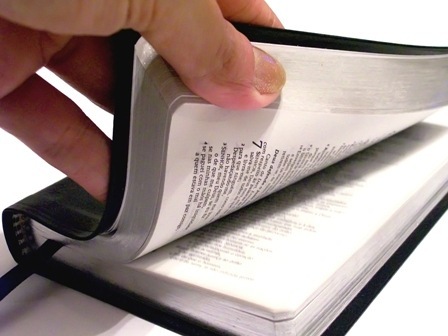 When shopping for a Bible, may I suggest that you obtain one that has large print? Okay, before that makes you feel like your Grandma, please hear me out. A lot of Bibles are written in rather small print. This can make reading difficult, especially when you are tired. Large print is much easier on the eyes, lends itself to reading faster, and makes for a much more enjoyable reading experience. I can tell you personally, after switching to large print I am never going back! I also suggest that you not use a study Bible for your reading Bible. Why? All the notes, cross-references, and illustrations can be distracting. This can make it take longer to read your Bible. For myself, I prefer a Bible with as little information surrounding the text as possible. I find I focus more on the text and can get my Bible reading done in the time allotted. I hope you have found these suggestions helpful. In my next post I will present you with some more items that will aid you in making your Bible reading enjoyable and productive. What is your favourite version of the Bible to read? Why do you like that one best? Leave a comment and let me know.